Desperately Seeking Attention: Santana Renee Adams, 24, told police in Barboursville, W.Va., that while she was shopping at the Huntington Mall, a man grabbed her 5-year-old daughter by the hair and tried to drag her away. The crime was thwarted when she pulled a pistol and confronted the man, who then ran away, she said. A short time later a 54-year-old suspect was found at the mall, identified by Adams, and arrested. “I’m thankful I was prepared to protect my daughter regarding asituation that could have gone worse,” she told a reporter. However, there were not only no witnesses to the supposed crime, Adams never even yelled for help. On the other hand, security camera footage indicates the man didn’t go anywhere near the girl, and Adams never pulled the gun that was found in her pocket, nor showed upset at any time. The next day, Adams told police that “she might have misjudged” and “overreacted” to the man, and maybe he was just “smiling” at the girl when he “pattedher on the head.” Even that was a lie. The arrested man said he never interacted with Adams or her daughter in any way, and charges were dropped — but Adams has been arrested, charged with filing a false report of an emergency. (RC/Huntington Herald-Dispatch) ...While she “might have misjudged” the situation, let’s hope the judge doesn’t. Pole Imposition: “You don’t write to a pole,” says Maria Sprizzo, “if you’re normal.” But the mail kept coming to her mailbox. Theaddress on it was her address in the New York City borough of Staten Island — her address, that is, with “pole” added to the end. “I’m reading this thing, and it says that I owe them $2,000,” said Sprizzo. “I called ... to no avail. Then I read it carefully and I noticed that the letter was addressed to the pole.” The bills and termination notices were intended to be received by a communications company which uses the pole. A Con Ed spokesman said that while Sprizzo was not actually expected tocome up with the money, billing the pole was standard procedure. (AC/Staten Island Advance) ...Is it anyone's standard procedure to check a pole’s mail? Pratt Fall: After being named Chief of the Milton, Ont., Canada, fire department in June 2017, Dave Pratt, now 51, announced he was “looking forward to guiding the effective and efficient allocation of fire resources” in the town that had grown from 31,000 in 2001 to more than 110,000 when he was appointed. It was the “allocation of fire resources” that got him in trouble: he has been fired after an investigation found he had used his department-issued SUV to “host sexual trysts” —sometimes while parked at various fire stations. Pratt, who is married, advertised his availability on a dating web site, his profile photo showing him in front of his SUV. “He was using Milton property, Milton’s vehicle, Milton’s budgets to fund his dates,” said one of the women involved. “He liked to brag that he likes to give women the ‘full fireman experience’,” said another. (RC/Milton Canadian Champion) ...I thought the “full fireman experience” involved putting firesout. Drone Pilots: Get Your Wings! Beautiful custom solid metal Drone Pilot Wings dress up your jacket and/or equipment box, showing your pride and professionalism in your hobby. Makes a great gift, and are much more durable than that T-shirt you liked. Get Yours Here, with discounts for extras. This Week’s Full Edition had nine more stories! Subscriptions to the “Premium” edition start at just $9, and this week you would have also read about: Small town finally repeals law against selling liquor, but there’s still one little problem.... Man poses as an Internet “celebrity” to lure a young girl to his house. School officials run to the first-grade classroom when a shot rings out ...and then the story gets stupid, rather than tragic. Youth sports team manager commitsmajor crime to try to get out of trouble over a minor crime. An amusing state legislature fight between parties settled in court. Obliviot rams his SUV through a store’s doors so he can steal ...$2.50 worth of beer. Doorbell Cam catches delivery driver taking a taste of the food he’s bringing. The weirdest wildlife poaching case you’ll hear this year. And the funniest “Redneck wedding” of the year. You can still read them all: just ask for your upgrade to start with the 7 April edition. See your upgrade options here and stop missing most of the stories! 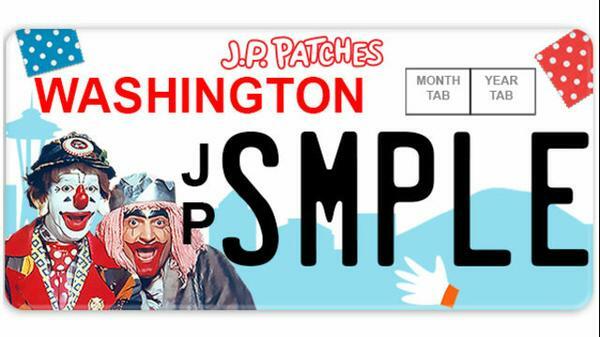 Patchwork: The State of Washington is considering a commemorative license plate to honor “J.P. Patches” — a TV clown that had a show on Seattle televisionfrom 1958 to 1981. Often running twice a day, around 12,000 episodes were broadcast. After it went off the air, Chris Wedes, who played Patches, continued portraying the clown for another 30 years at charity events, and died in 2012 at 84. A bill to create the new plate has already been approved by the State House. “We hope to see as many J.P. Patches fans as possible in attendance” at a hearing in front of the state’s Senate Committee on Transportation, said organizer Erik Madsen. If the billpasses muster at the Senate committee level, it will go to the full Senate for a vote, and then to Governor Jay Inslee for his decision and signature. (RC/KIRO Seattle) ...So the clown plate’s availability now depends on the clowns in the Senate. Did You Find an Error? Check the Errata Page for updates. This Week’s Contributors: MS-Mike Straw, AC-Alexander Cohen, RC-Randy Cassingham. In An Editorial About the woman who said a foreign man had tried to drag her daughter away at a mall, the Huntington Herald-Dispatch editorialized that the false accusation “brings shame to the entire area,” and notes that if she is convicted, Santana Renee Adams faces a $500 fine and up to six months in jail. Continues in my blog, Desperately Seeking Attention,which includes police statements about why they think she did it (and why I think the cops are heroes), and a rather amazing photo of Adams she previously posted to her Facebook page — which has since been shut down. Since then, the Patreon support level has fallen below $600/month. So much for my prediction! After running the numbers, I’ve reset that goal to $1,500 to better account for Patreon’s fees. Plus, Google has a new ad filter that ”should” stop the objectionable ads from being displayed. On the other hand, I’m also considering putting all of True’s stories on the web site each week. That would necessitate some kind of password protection scheme for the Premium-only content, but it would enable you to comment on any story you wish (and thus discuss them with other readers), and get in to still see stories even if your emailed issue doesn’t arrive for some reason. The neat thing about that: if you’re “logged in” to the site as a Premium reader, I’d be able to setthe site to not show you ads. There’s lots of engineering and programming that would need to be done, so if I do go ahead with the idea I can’t see it being fully operational before July or so. But I thought you’d be interested in hearing the idea. Ten Years Ago in True: Just another Routine Police Matter. Last Week’s Issue on Medium (please do share the link). Today on Randy’s Random: Cure What Ails You. This Week’s Honorary Unsubscribe goes to Joe Bertony. An engineer, Bertony made it possible to build one of the most iconic buildings in the world — and how he did it is awe-inspiring. And So Long to artist Dan Robbins, who created “paint by numbers” in the late 1940s, which sold by the tens of millions by the mid-50s. He died April 1 at 93. Plus, Goodbye to science fiction writer Vonda McIntyre, a Hugo and Nebula award winner best known for her novelizations of several Star Trek films as well as original Trek works, Dreamsnake, and the Starfarers series, dead April 1 several weeks after being diagnosed with pancreatic cancer. She was 70. Basic Subscriptions to This is True are Free athttps://thisistrue.com. All stories are completely rewritten using facts from the noted sources. This is True® is a registered trademark. Published weekly by ThisisTrue.Inc, PO Box 666, Ridgway CO 81432 USA (ISSN 1521-1932). Copyright ©2019 by Randy Cassingham, All RightsReserved. All broadcast, publication, retransmission to e-mail lists, WWW, or any other copying or storage, in any medium, online or not, is strictly prohibited without prior written permission from the author. Manual forwarding by e-mail to friends is allowed if 1) the text is forwarded in its entirety from the “Since 1994” line on top through the end of this paragraph and 2) No fee is charged. We request that you forward no more than threecopies to any one person — after that, they should get their own free subscription. We always appreciate people who report violations of our copyright to us. To get True delivered to you every week, click here to open a subscribe form.